This weekend marks 100 years since Stonehenge was gifted to the public, and Jeremy Deller is bringing the party with his bouncy castle version of the monument. The Turner Prize winning artist is bringing his 2012 work Sacrilege – which consists of an life-sized inflatable Stonehenge – to the World Heritage site for the first time. Can you help us? Do you want to give something back to the community? We want someone who will challenge the Police and Crime Commissioner (PCC) and the Chief Constable. This is a rare opportunity for a member of the public to join our Joint Independent Audit Committee.The Committee provides advice and independent assurance to the Commissioner and the Chief Constable according to good governance principles. It is provided with briefings from the Commissioner, the Chief Constable and their teams. Members have an opportunity to hear about the varied and interesting work done by Wiltshire Police. The Committee provides support and challenge to our joint Chief Finance Officer and sits alongside the internal audit process checking and testing what the Commissioner and the Chief Constable do. – can be objective in evaluating information. The PCC and Wiltshire Police are equal opportunities employers and welcome applications from all the communities we serve. Auditing experience is not essential however a general knowledge of good business principles would be an advantage. This book is designed to record information about those of our community who died in the First World War. Also included are local men commemorated elsewhere and others from far away who are buried in our churchyards. As far as the compilers can ascertain there are sixty-nine men and one woman with a local connection, who did not return to their loved ones after the war. To the families of these 70 casualties, they were sons, brothers, fathers or grandsons and, in one case, a daughter, whose death would have caused much misery and grief. They would have been well known by those who loved them, but with the movement of people over the years, many of their memories are lost. Identified now only as names carved in stone, their individual personalities have disappeared. This book is an attempt to re-discover something of their lives and record it, a small group of local volunteers, began by transcribing the names which appear on the war memorials in Chitterne, Shrewton and Tilshead. To these were added others from local monuments in churches in Maddington, Orcheston and Rollestone. Our quest was hindered by the paucity of individual service records from 1914-1918; the result of air raids in World War Two. We began by consulting the cemetery and memorial registers of the Commonwealth War Graves Commission (CWGC), all now available online – www.cwgc.org. Further information came from the HMSO publication “Soldiers Died in the Great War:. From these sources, we were able to discover the locations of graves or memorials, dates of death together with places of birth and enlistment. The family background of local people was discovered by some exhaustive research including the relevant census, notably 1901 and 1911. For those who served with Commonwealth units, full service records were available. Medal index cards record the awards made to servicemen and were helpful in identifying those who qualified for the 1914 and 1915 Stars, with the date of their deployment. Other invaluable sources were the War Diaries, maintained by individual units and describing their daily moves and activities, sometimes in detail. From these diaries it was usually possible to establish where a man died and why he was there. Not all were killed in action. Some died of illness, notably in the ‘Spanish Flu’ pandemic of 1918, in accidents or while prisoners of war. At least one took his own life. There are two cases of servicemen who died after the war; the result of wounds they received. Despite our best efforts, some of the stories are sketchy, with an element of informed guesswork. Whilst we have done the best we can, some errors may exist. Certainly, anyone planning to visit a grave or memorial should check with the CWGC that it is still as described here. Since it appears that it is not widely known that Shrewton has a thriving Dog Club, the Members thought that this introductory article would confirm that the Club is, indeed, alive and well! By way of background, Stan Browning founded the Shrewton Dog Club about 18 years ago. From that early time, Kerry Eggleton, who also lives in Shrewton, was training to be an Instructor and became his Assistant for the lower classes. 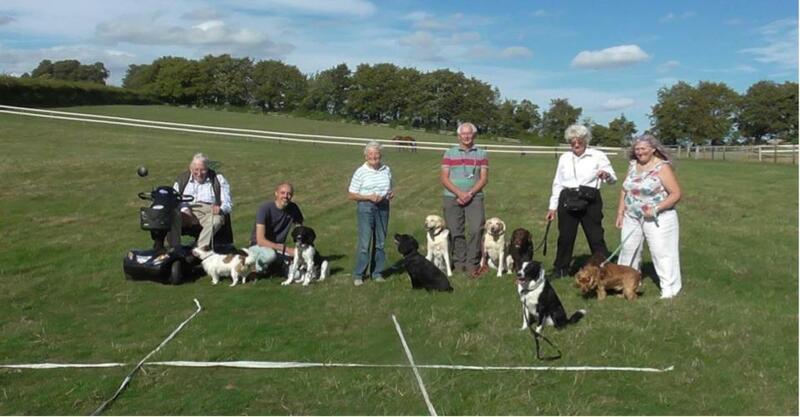 The Club thrived for several years, successfully holding a range of events including: Dog Shows, Kennel Club Good Citizen Tests, Displays, a sponsored dog walk and even a dog themed panto. Sadly Stan passed away. unexpectedly in 2011, and the club closed down. In 2012, it was reopened by the then Secretary, Lynn Denniston who reopened it with Kerry Eggleton as the Trainer. Since then, the Club has held annual Kennel Club Good Citizen Dog Tests, with several dogs achieving the sought after Gold Award. 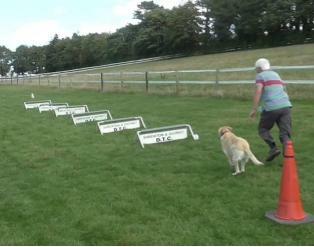 It has also put on Displays at the Riding for the Handicapped Centre in Wilton, organised Agility days and Dog Walks. The Dogs have also had their own Christmas Party and the Owners enjoy an annual Trophy Evening in a local Pub. The Club meets monday evenings at shrewton village hall new dogs must be assessed suitable for class training but all breeds and sizes are welcome so far the membership has included a tiny yorkshire terrier “Barney” and the giant Leonberger “Shiloh”. Some of the dogs have also had other roles, as therapy dogs, gun dogs and even a sheep dog. The Dogs are presently busy preparing for this Year’s Annual Kennel Club “Good Citizen” Tests and, in September, held a Fun Event Day that allowed the dogs to “Have a go” at the obstacles! Next year, the club is hoping to expand its number of activities and maybe introduce a permanent puppy class. Very soon people will be noticing that our winter visitors from Wales will be on Salisbury Plain very close to our village, that is our woolly friends the sheep. Dog walkers are reminded therefore to keep their dogs well under control within the vicinity of sheep, and if very close to sheep on a lead. Once a dog has chased sheep and tasted blood it is likely to do so again. If a farmer or landowner witnesses a dog chasing and harming his sheep he has the legal right to shoot it. Not long until Bonfire Night which we will enjoy and look forward to. If anyone is planning a firework party in their garden please inform their neighbours especially if they have animals. We are a village surrounded by farm land with sheep, cattle and horses as well as domestic animals, so please bear this in mind before preparing to let off loud bangs. Bonfires and hedgehogs. Before lighting a bonfire please search the base for any hibernating hedgehogs. Many hedgehogs are cremated at this time of the year unintentionally in bonfires. We are losing them fast and every effort is being made to build up numbers. Keep a patch of your garden ‘wild’ so that they can hibernate in the undergrowth. Please see below minutes from the September Parish Council Meeting approved at the meeting held in October 2018. The October minutes will be published in November. If you have any comments regarding these minutes please contact the Parish Council directly. The Parish Council contact details are published in the Tilshead Newsletter. The next Parish Council Meeting is on Monday, 12th November 2018.